Moreover, I’ll try to post regular updates on Facebook. So please check these channels regularly and cheer for us a bit. We need your support 🙂 ! 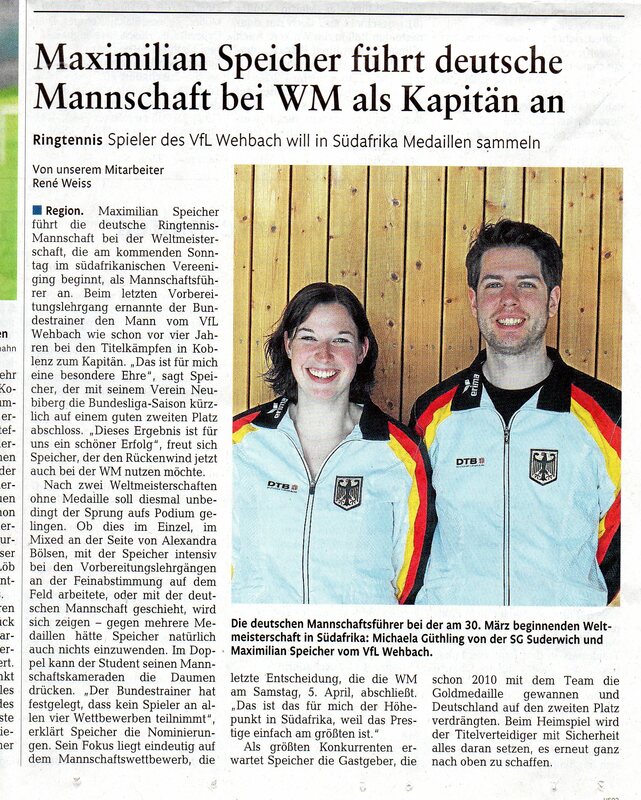 Nomination of the German national team for the 2014 Ringtennis World Cup. OK, so there are only 13 days left until the German national team and I leave for South Africa . Training is going well so far. I’ve been practicing daily for two weeks now and already feel quite well prepared. Actually, I’ve been watching videos of the last world cup all day because I really can’t wait anymore! 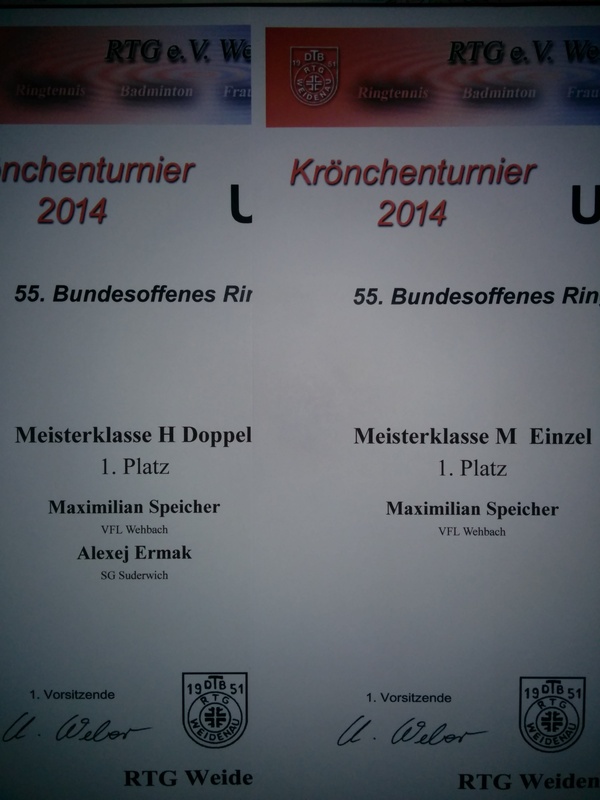 The past weekend, we played the finals of the German ringtennis Bundesliga (i.e., the first league). My teammate Alexej Ermak and I played for the club of TSV Neubiberg-Ottobrunn, who participated in the Bundesliga for the first time this season. Thus, we’ve been kind of underdogs from the start. Yet, we managed to beat last year’s finalist Lichtbund Karlsruhe—who lost the 2012–13 championship only after a round of deciding games—and finally secured an overall 2nd place. Regarding the greenness of our team, this is quite an achievement—especially for our ladies! Congrats and thanks to all my fellow teammates: Annika Lemke, Stefanie Beck, Sophia Speicher, Gunther Kaiser and Alexej Ermak. Great job! Concerning the upcoming world cup, it’s now official that players from seven nations will be participating: Bangladesh, Belarus, Germany, India, Kenya, Nepal and South Africa. It’s going to be great! We’ll be meeting lots of old and make lots of new good friends (and maybe bring some medals home 😉 ). The organizers are also investigating the possibility to provide live streams of important games. Please check wtc2014sa.com regularly to stay updated. There are also official Twitter (@wtc2014sa) and YouTube channels available. These are actually pretty good questions. Let me see … I think the only time in my life I’ve been that nervous was at the 2010 World Cup in ringtennis, which was held in Koblenz (Germany). It was the last match of the world team championship. Germany vs. South Africa. The winner would become the new world champion. 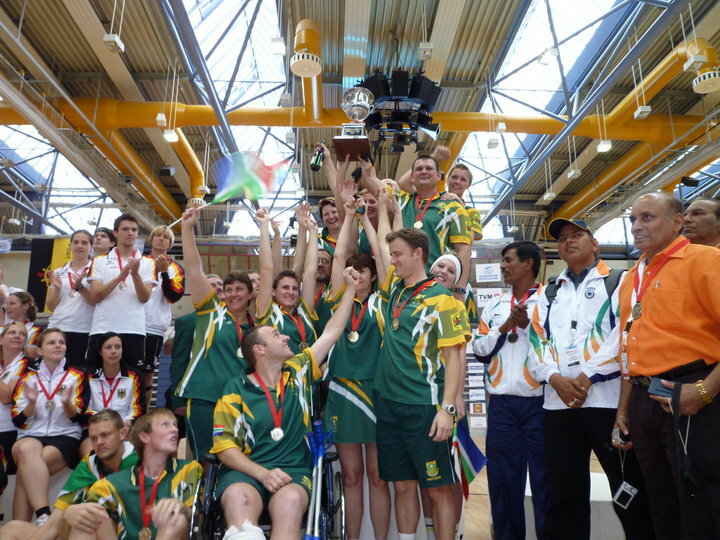 We, the German national team, were the defending champions and although we were playing at home, South Africa was leading 10–6 before the last round of doubles—one women’s and one men’s double. We all knew that we had to win these last two games to reach a draw (10–10) and proceed to an additional round of deciding games. I was playing with Dominic Schubardt, who had won the singles championships, and although we had become the unofficial world champions in men’s doubles three days before, we both knew that we were not able to play at 100% that day. Our opponents were quite dangerous: Hanno Pienaar, who had already beaten Dominic in the very same match, and his very experienced partner Bertus le Roux. The fear of failure and maybe becoming the one to be blamed for losing the world cup made me extremely nervous. I was so horribly on adrenaline right before the game some friends even said they didn’t recognize me. However, once the game started—the crowd cheering for us—and we were in the lead after scoring some important points, our nervouseness settled. We were finally able to win the game 45–35. It wasn’t nice-to-watch and a stiff piece of work, but we made it. Unfortunately, Lenize (the women’s champion in singles) and Heleen Potgieter of South Africa won the other double to make their team the new world team champion. In retrospect, South Africa deserved the title, because despite not having the better individual players, they were the better team. 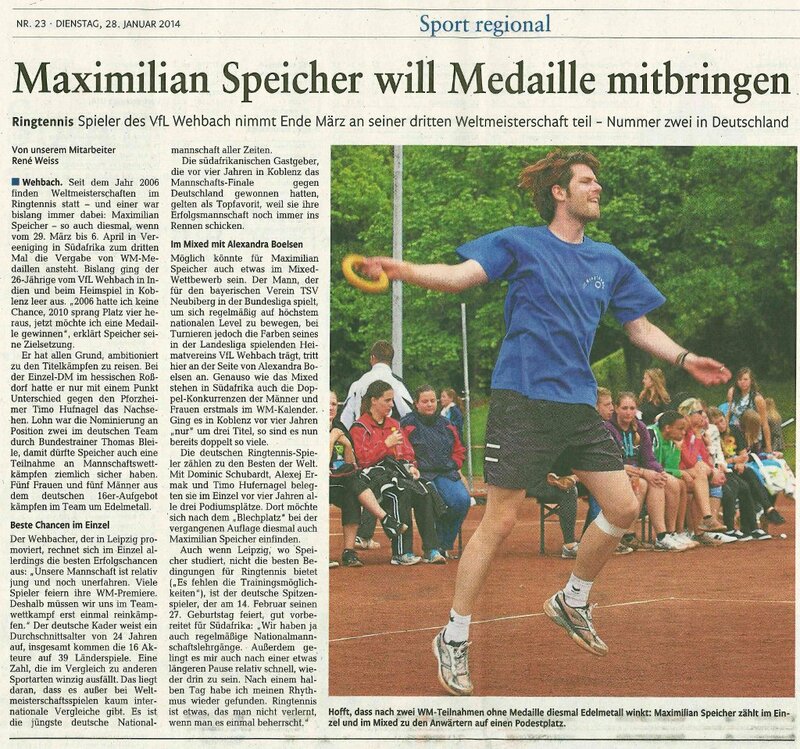 I just came back from the last training camp of the German national ringtennis team before the 2014 World Cup in South Africa, which has been held in Mannheim. We’ve had fun, we’ve worked hard, we’ve played a lot of ringtennis and I’m sure we’re well prepared for the big event in March. Special thanks go to our coaches: Thomas Bleile, Jürgen Öttel and Christian Herzog. They’ve worked at least as hard as their players and have done a tremendous job so far. In my opinion you’ve formed a fantastic team and we’ll do everything in our power to reward you for your efforts. Thanks also go to our team manager Silke von Aschwege, who spares no efforts as well. There’s only one event left before the World Cup: the final of the German national league, which will be held in Diedenbergen on 8th of March. South Africa, prepare for a highly motivated and talented German team! Only 43 days to go!